Plot Summary: mouse and his child. The father mouse speaks in a monotone voice that may possibly drive you up a wall. Anyway, they end up on a journey to become independent and self winding. 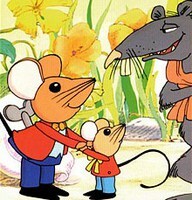 During their travels they run into Manny the Rat, who uses toys especially wind-ups, to do his dirty work. A very interseting, and funny part is Manny the Rat crashing the theatrical production and starts to recite some heavy vocabulary until getting hit in the head with a tomato. A joint production of deFaria-Lockhart Productions and Sanrio, in association with Murakami-Wolf Productions.